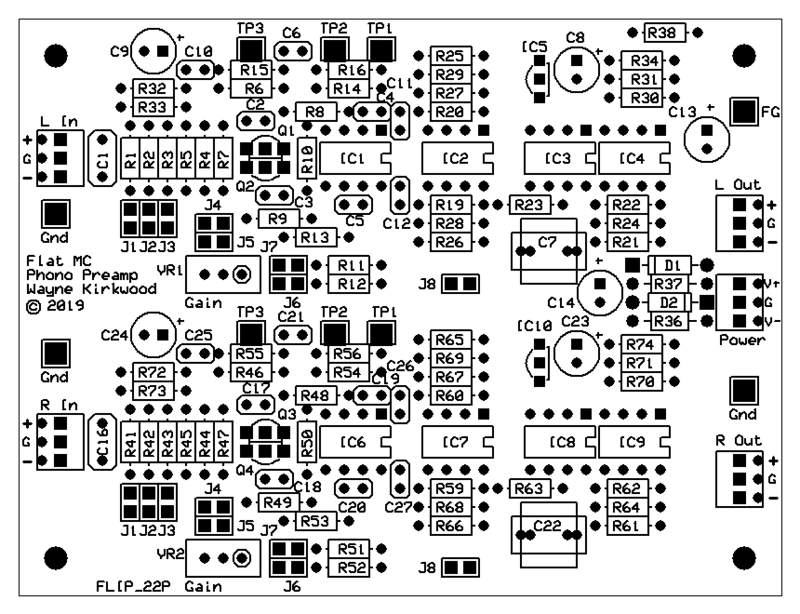 The actual board is 3.2" x 4.1" which is 0.2" and 0.1" larger than the moving magnet preamp board. I made the hole pattern identical so it will be possible to switch out boards between MM and MC boards in the same metalwork. I scaled the Deboo capacitor and resistors to accommodate a 5 mm 0.33µF polypropylene which is the largest value in that case size. C7 and C22 can also accept 8 mm capacitors. The input transistors are mounted back-to-back to maximize their contact surface area. I'm thinking the transistors can be installed, tested, glued together and then a thermal "hat" placed on them and secured with more epoxy. Those little bits of cut Accutronics springs I have floating around or any small spring might make a good clip to hold them together. I think that might be easier than my M7 nut to glue. The 3AG fuse end cap also looks promising. Since its going to be in a box without moving air current mass should be less critical. I'll reserve space for it in my preamp immediately! If you are selling off any of the first run boards I'll take one. I like the 300 ohm feedback R's to manage their noise contribution. Perhaps marginal for 5532 drive capability but don't expect much voltage swing there. There are modern uber op amps that reportedly drive 50 ohms but never confirmed that... I expect there are diminishing returns with scaling those values down further as already quite low. 2.7 nV/rt Hz THD 0.00003% 55 Mhz 140dB capable to drive 600 ohm ( Iout +/- 23mA ). You think I've been in a freakin' cave since 2009? LM4562/LME49720 process issues have been giving Viktor and his oscillator fits. He throws about half of his LMEs away due to burst noise. Then there's the cordless phone problem. 5G ought to be even worse. I have a bunch of noisy LME49860 I'm throwing away because they are unusable. I don't need to double-check anything - whoever builds these can use whatever blows their skirt up as long as it doesn't oscillate. At most gains the front-end noise dominates anyway. @JR As you and others have pointed out in Cohen's design the 5532s don't swing the full range: The cross-coupled output stage has 6 dB gain and clips at +27 dBu. The maximum the differential output of the INA can swing is +21 dBu without clipping the final output and each op amp only sees about +15 dBu single-ended. +21 dBu into 600Ω = +15 dBu into 300Ω = 20 mA peak. They're supplying Ie however which is about 5.5 mA nominal so they're in class-A and a significant chunk of output current is devoted to bias. So maybe 25 mA peak with a 300Ω Rfb. Rfb is bounded tightly by op amp current on one hand and headroom on the other at least at the high Ic in this circuit. A mic preamp optimized for higher-impedance sources with a lower Ic would have more wiggle-room for Rfb. @ Bill: Saving one for you. Wanted to clarify for readers the "benefit" of the 6 dB gain in the final output. It reduces the peak current demands drving Rfb by half. If someone needed more gain (66 dB max) they could use 499Ω for the Rfb. The common mode voltage at the INA output would be about -2.75 VDC vs. -1.73 VDC with 316Ω so there would be a slight HR loss. I'm no fan of the LME49720 because it has so many warts. Until they fix the EMI susceptibility and burst noise I can't recommend them particularly in high gain applications. TI admits in the forum they can't screen for the burst noise due to the test-time and I've never seen a TI admission of the EMI problem. Many years ago when I first saw announcements about op amps with 50 ohm drive capability my mind wandered to what could that be useful for in audio? IIRC a lot of ADSL Line Driver op amps got "re-purposed" to audio when ADSL promptly died in the market. Our 'hood was never able to get DSL here due to distance limitations and we were one of the last to get fiber. Pushing ADSL modulation down phone lines required some incredible low-distortion high current op amps. I think at one point I experimented with 100Ω feedback resistors and paralleled op amps. I can confirm that. I have some of the first gen TI ADSL line drivers that I was given as headphone amps about 20 years ago and never used. These parts are now available renumbered as audio parts and sold as headphone drivers. I did do a few back of envelope calculations on high current drive op-amps to reduce the feedback resistor and rapidly realised that it gets very silly very quickly and at that point if you must have impossibly low noise then you pick another topology. 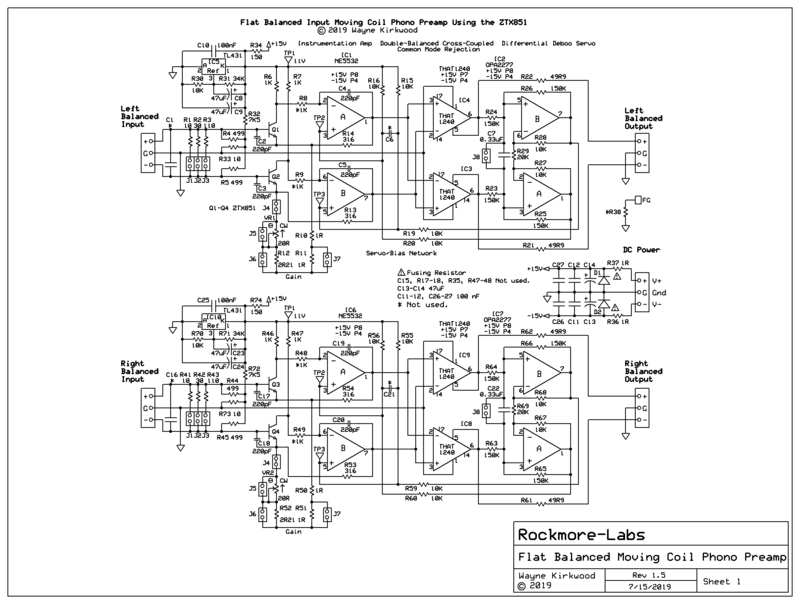 Over the decades we've seen designs extremes, like audio power amps that could pass RF.